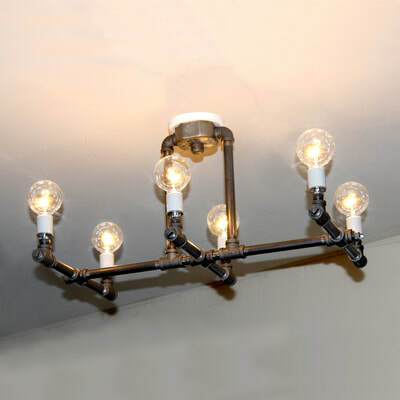 ​LAMP REVIVAL builds unique hanging lamps, ceiling lights and pendants from recycled lamps, electrical parts and other salvaged materials. All have a chain or hook loop, 15 foot cord, line switch and plug. No wiring required. A bathroom renovation left a severely restricted 5-inch space on both sides of the mirror. 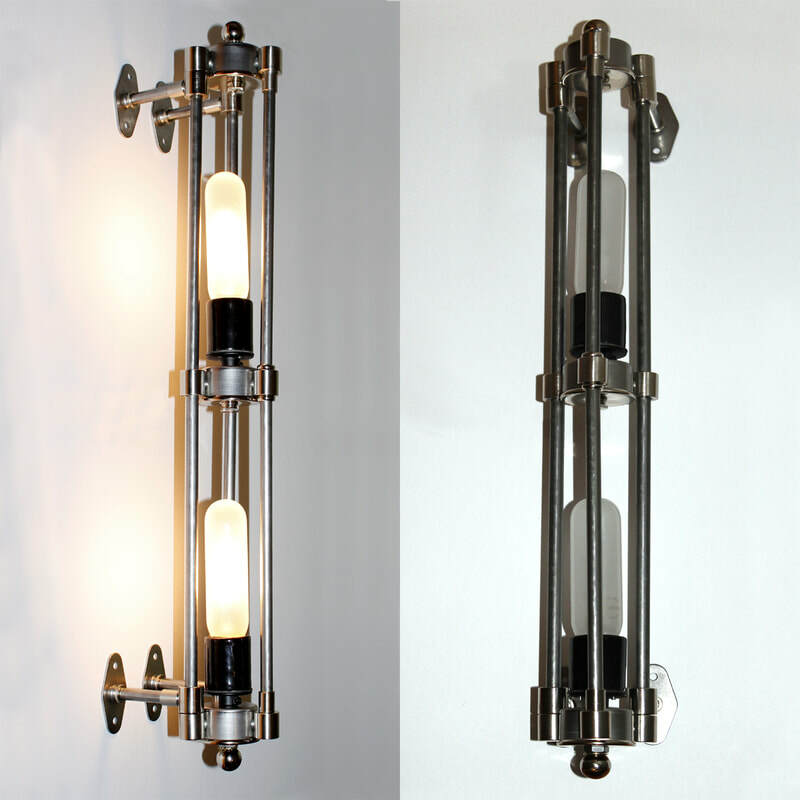 Problem solved with this custom tall slender tri-pipe sconce that's only 3 inches wide and 23 inches high, while still providing plenty of light. 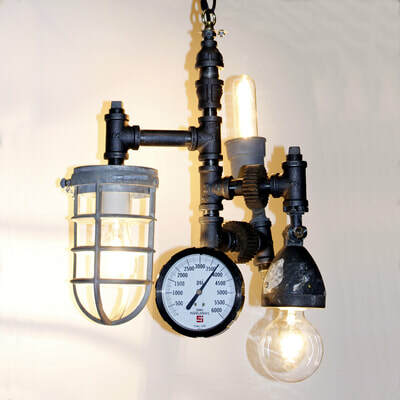 This industrial version features raw steel pipes and bodies with 2 black porcelain sockets, but could be built with more refined brass or nickel components and 1 to 4 bulbs. 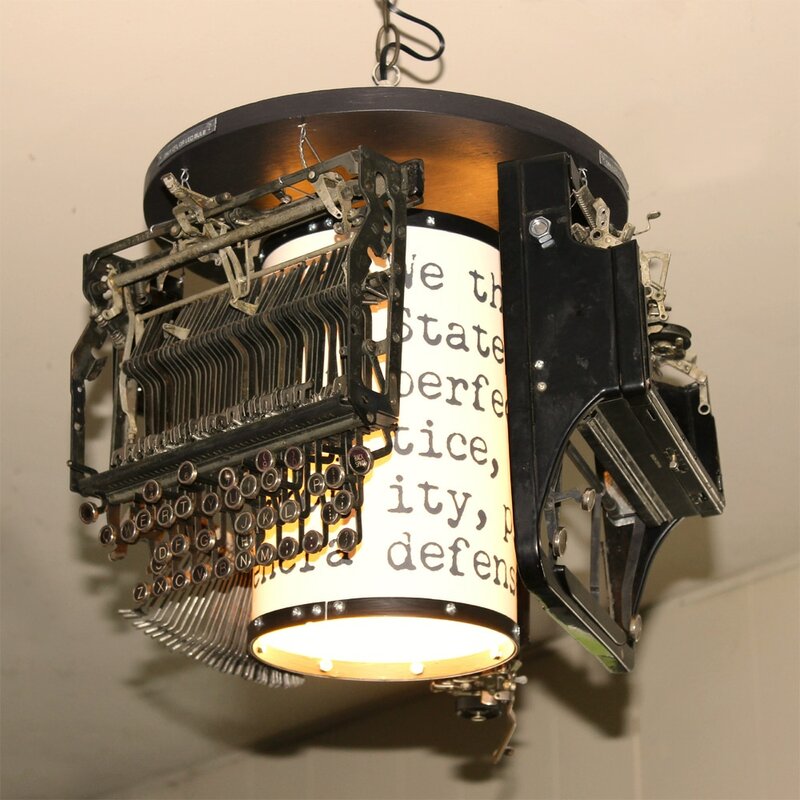 The typewriter components surround the cylindrical center shade printed with greatly enlarged Remington Noiseless mechanical typewriter font. 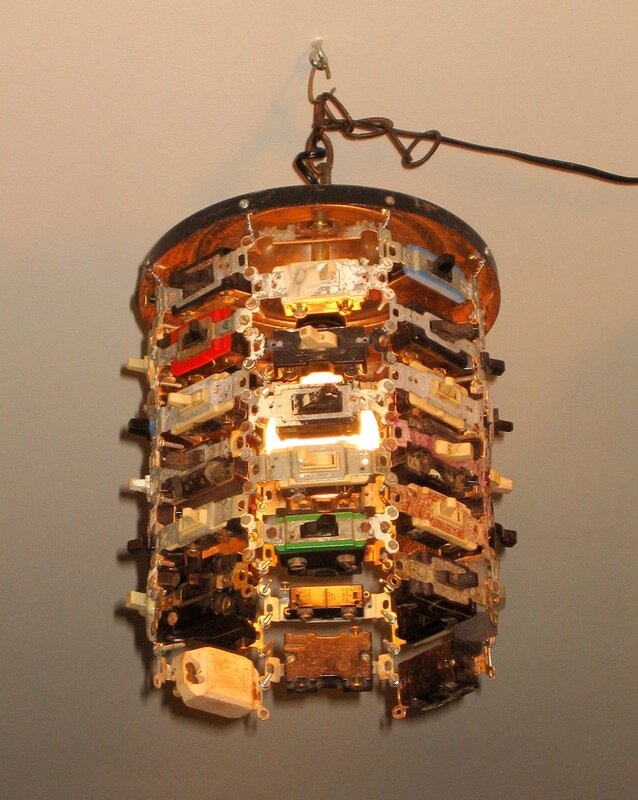 Dissected Royal Portable Standard Model O Reconstructed into Quirky Ceiling Light. 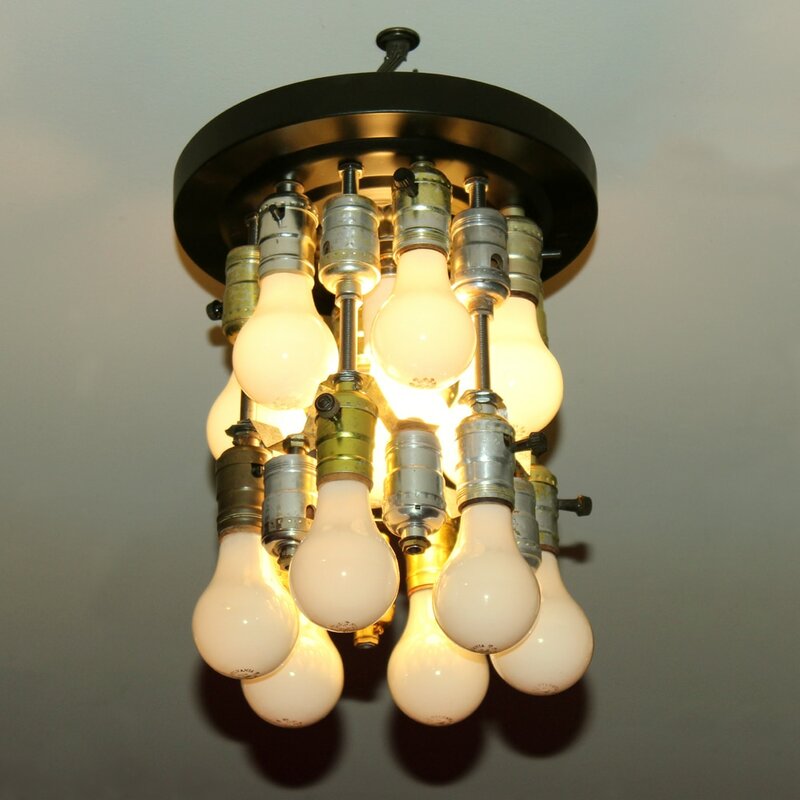 24 recycled bulb sockets and 12 unlighted outer bulbs receive a warm glow from the single electrified central bulb. Approx 9" diameter x 13" high. 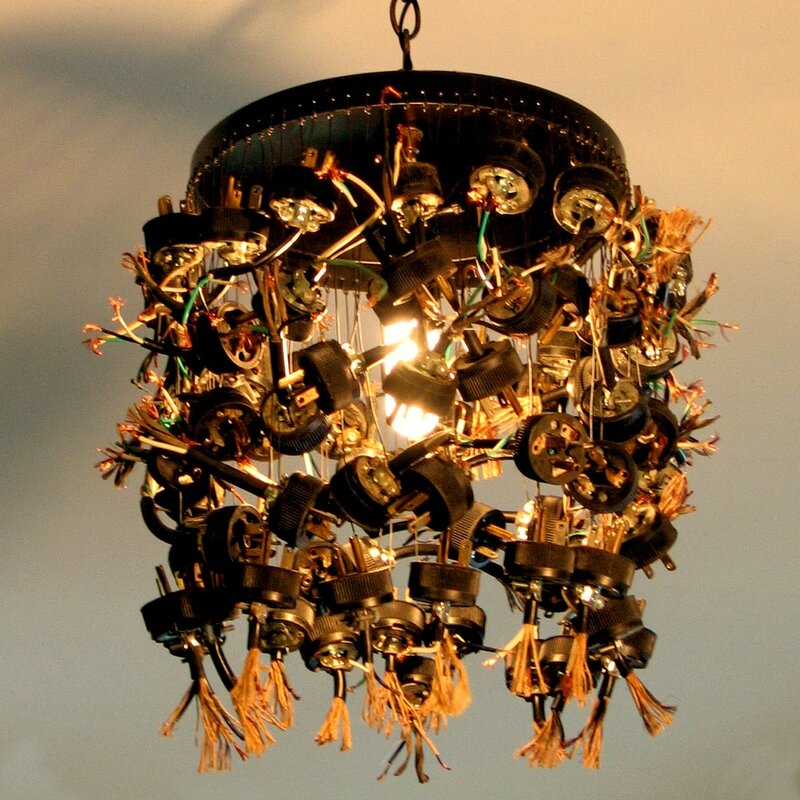 A recycled collection of antique porcelain switches, plugs, sockets, old bulbs, insulators and wire. 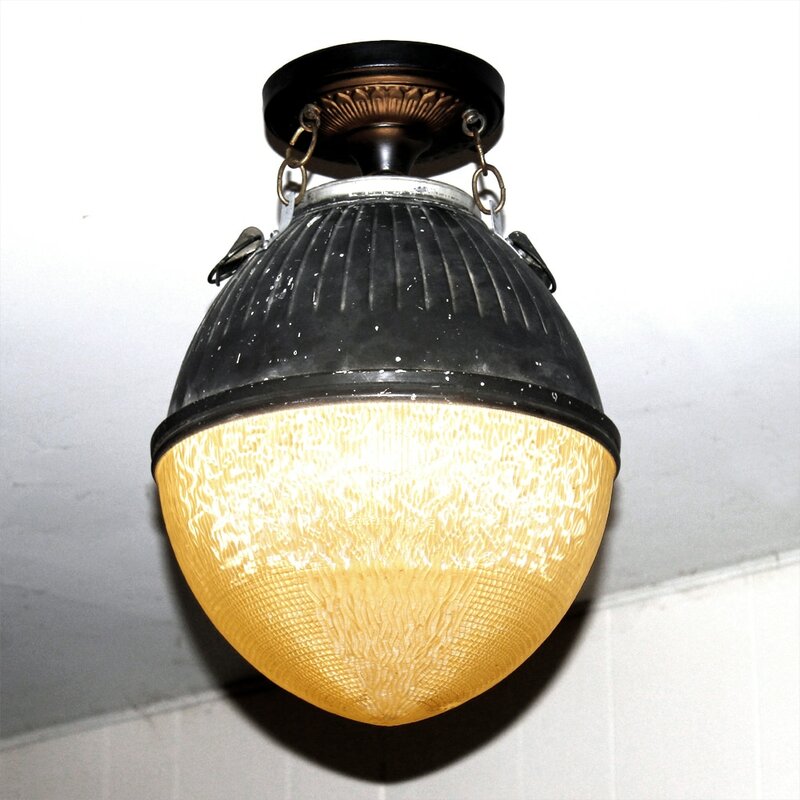 One main light and five dangling lighted bulbs. Approx 16" diameter x 15" high. 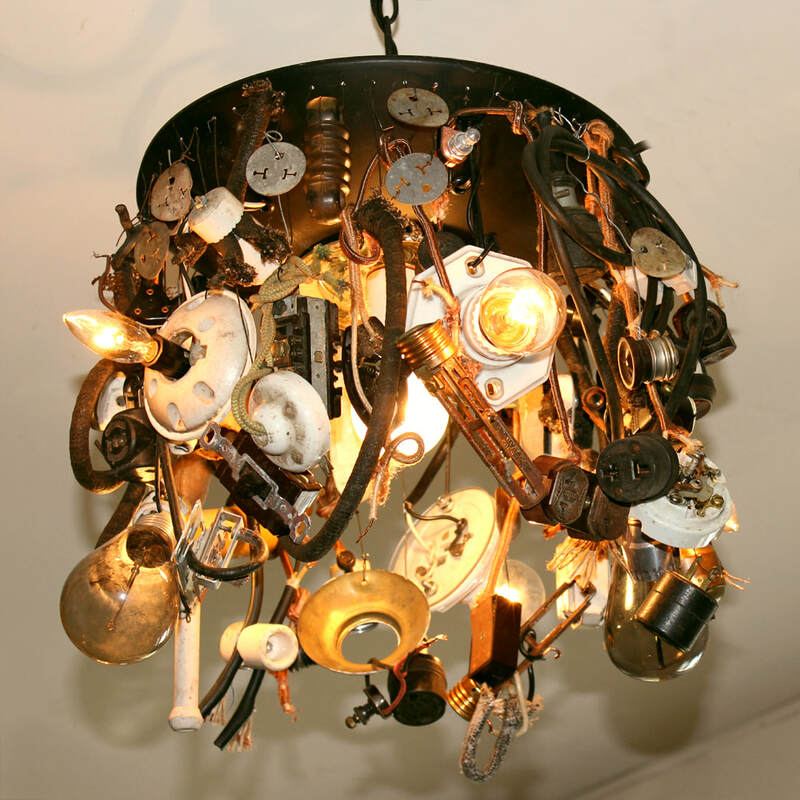 Built with 48 antique and distressed electrical switches (but fortunately, operated by a single power cord switch). Approximately 14" tall x 11" diameter. 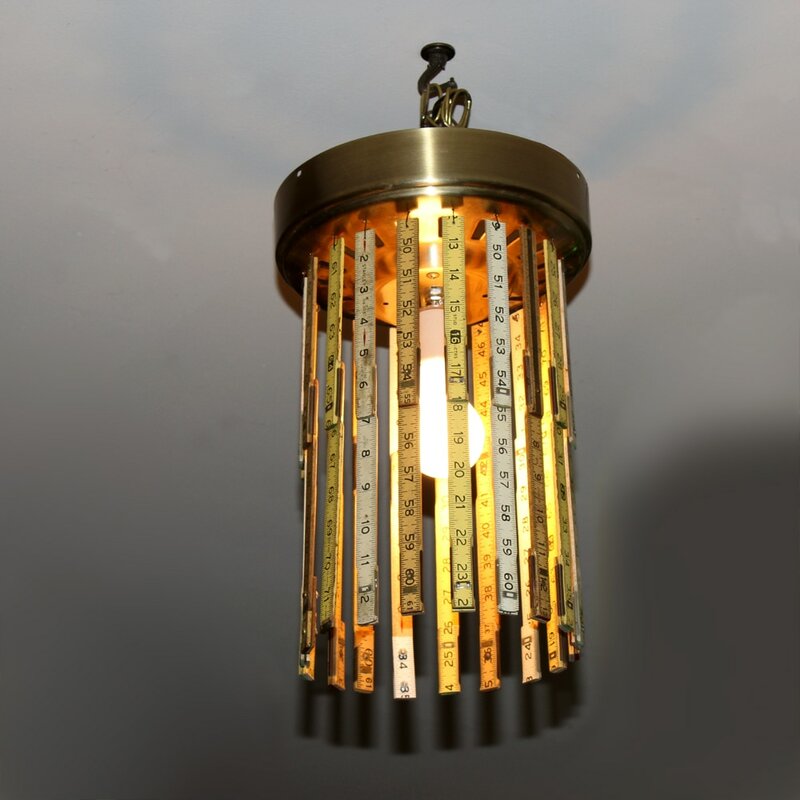 Decorative recycled ceiling light with sections of folding carpenter rulers on a ceiling fan hub. Approximately 8.5" diameter x 14" high. 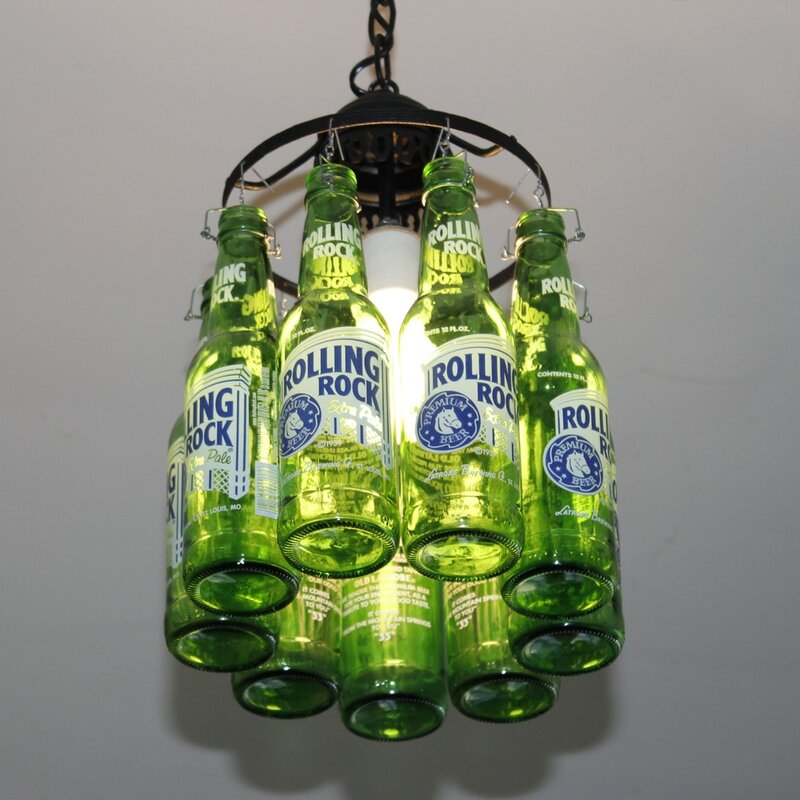 Soft drink and beer bottles make a contemporary ceiling light with colorful bottles back-lighted by a single central bulb. Available with your preferred brand.